Indian inflation has risen to a two-year-high, raising the possibility of interest rate rises. The wholesale price index rose to 10.16% in May, the highest since 2008. Rising food and fuel costs have pushed the rate well above forecasts, which were nearer 9%. The government says prices will come down soon. The rise in the inflation rate comes after India recorded its fastest growth in manufacturing in at least 15 years in April. Unlike most countries, India calculates inflation on the wholesale price of a basket of 435 basic goods, which means actual prices paid by the consumer are much higher. Oh well, atleast it wasn't "unexpected". Its OK, the rising pound will insulate us from this kind of inflation. strongly rising working age urban populations will tend to drive inflation, just like the 70s in the west. the reality is is that sometimes inflation cannot be prevented, since it is not always and everywhere a monetary phenomenon. if supply exceeds demand (due to rising population for example) then the only solution to prevent real prices rising is to increase supply. If one seeks merely to suppress demand by raising interest rates this simply serves to decrease asset prices without decreasing the demand for supply of basics like food and fuel which leads to, you guessed it, stagflation. 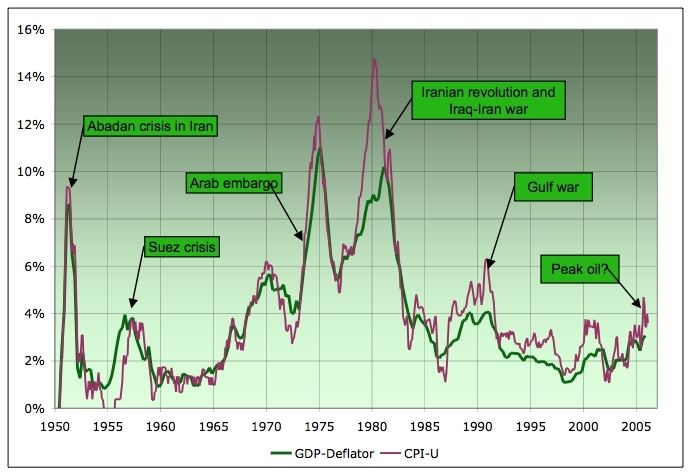 note that inflation takes off just as oil production goes flat (stops growing ) in about 1973. 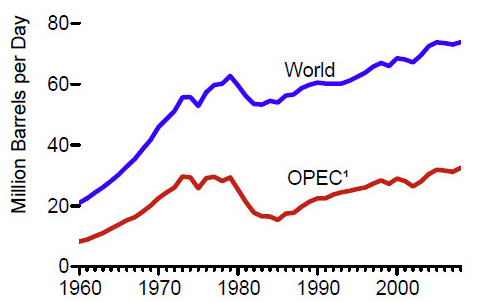 It doesn't come back down despite v high rates until the oil production begins to trend upwards again in about 1983. The Indians will be squeezed due to the size of the population. Too many people, the Indians could be heading towards a hyper-inflationary collapse leading to millions starving. Indians has big problems the population is still expanding and there is there are finite resources on the planet. Both China and India will have huge economic problems. Part of my prediciton is India and China "boil over" with very high inflation in the next few years, which will take their standard of living down a notch in the short to medium term (say 2020). The US will be the interesting one. They're going to inflate way more than the UK and Europe, starting sometime in 2012. Indeed they do but in the case of India there is a near infinite supply of new labour emerging so the cycle cannot be broken. As economic dislocation between the urban and countryside widens political tensions will grow. India has so far dealt with this problem through emigration, I wonder how long the rest of the world will bear the burden of Indian political failure? The government says prices will come down soon. Phew. All is fine then. All the financial bets have been against currencies like the Euro and Sterling into almost everything else. India and China have essentially marcantilist trading policies so they need to neutralise these capital inflows to keep their currencies and their economies competitive. This means dumping a LOT of your domestic currency on the market to keep its price down. Sooner or later these Rupees or Yuan find their way back into the local economy which is the only place they can be spent. The net result is inflation (ie more money chasing the same amount of goods). Higher interest rates could be used to lock up this money in domestic savings accounts ( ie reducing the velocity at which the cash circulates) but of course that would increase the incentive for foreigners seeking yield on their savings to park their money in your currency thereby driving up its value. The only otherway to prevent this hapenping is to introduce controls on the movement of capital. That might be a naked protectionist step too far for even for the 'globalisation' fans in the West. This means dumping a LOT of your domestic currency on the market to keep its price down. No, you're describing what countries with no capital controls would do (e.g. Switzerland). What China does (I can't tell about India, I don't know) is that whenever a Chinese company receives dollars and wants to change them for Yuan it goes to the govt. The Chinese govt prints the required amount of yuans and gives it to the co., and buys treasuries with the company's dollars. So the inflation is indeed imported, but not in the way you describe. That's a thought-provoking post. I wonder if there are Chinese or Indian bonds that are only [practically] available to locals? Conceivably such a mechanism could be used as a form of "soft" capital control, to soak up domestic savings in a way that allows the authorities to manipulate the currency, with the foreign-currency proceeds being recycled as debt in order to sustain export demand. It's not unexpected. Both India and China have had a long run of low inflation due to expanding population. But policies designed to control this (China more so) mean that they cannot keep it down so easily. The whole world will notice as they import this inflation. Thanks, that's interesting. It would seem to amount to a form of capital control, given that (I presume) non-Chinese companies can't access this mechanism. Yes, it is complete capital control, the Chinese are no trying to hide it. What I described was on the simplistic side but is conceptually correct. This is excellent news for lots of uk industries.. eg. off-shoring call centres to india, and the IT jobs that have disappeared. On the computing side, it was always touch and go whether it was worth off-shoring, given the language, cultural and timezone differences. But this kind of thing just hammers the nail in. As well as the indians getting more expensive, our local workforce is getting cheaper, as the collapse in jobs means that uk workers will work in UK jobs for less. A double-whammy for the indians. After Globalisation, it's now time for Localisation. Time for lots of factories to appear.. It will be no bad thing to have people working for UK companies, earning their money in pounds, paying their taxes and contributing to the uk. And they say protectionism is bad... this could be the UK's saviour if our glorious leaders could spot the trends and start encouraging enterprise. Here's the bad news. I found out over the weekend that a major fund management company in the City is now using Vietnamese suppliers for software development because Indian suppliers were getting too expensive (e.g. more than a tenth of UK providers). Those UK IT professionals will have to wait just a little bit longer. I don't think that applies in the case of india. As I understand it the main reason for those indian capital controls that exist are to prevent capital inflows that damage the economy in the same way as large capital inflows damaged the pigs , the US and the UK the last 6 years or so. The money comes in, messes things up then buggers off. Brazil has also move to stem capital inflows. I think its fair to distinguish between mercantilism and a sensible policy to say no-thank you to speculative hot money. Sensible or not capital controls are designed to 'protect' your economy from outside economic forces. In a true free trade environment they would not exist. so what? there never has been and never will be any such thing. and we'll be seeing a hell of a lot more of them before very long because it'll be the only way to stop all the capital in western nations departing eastward and southward.